Bollywood dance is a commercial name for modern Indian dancing. It's a combination of classical Indian dance, folk dancing such as Bhangra and sometimes has a Latino and Arabic influence. Our Bollywood dance hen party in manchester are fun and very expressive . There's a lot of deep meaning behind music in the films. You can actually express what the music means, through the graceful movements of the body. Your bollywood dance instructor will give you a taster of the art of bollywood and you will learn a choreographed routine and you will at least have a lot of laughs! 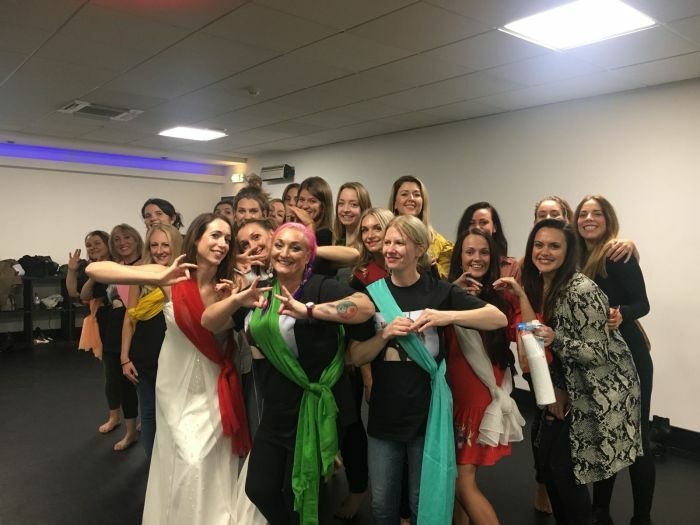 Our teachers are professional trained dancers who not only teach but perform on stage in concerts have experience with choreography to make your dance hen party an activity to remember!!!!! Authentic – why not go for some traditional dress? Sari's can be bought / hired easily and will really make your Bollywood party much more fun. You can have an option to have your Bollywood dance hen party in either a bar or in our dance studio which is mirrored with sprung woodenfloors. Both locations are situated in the city centre in Manchester . We can hold your hen party on any day of the week, at a time to suit you in a location close to your day or night out- morning or afternoons.